Pastor John Goguen of Agape Bible Fellowship has assembled one of the world’s largest libraries of deliverance materials for equipping the saints in the Full Gospel ministry. Please take a look through our online bookroom. We think you will find many resources that will help you in your walk with Jesus Christ and equip you to meet your enemy on the field of battle and emerge victorious! We are a small ministry and do all of our own shipping and product fulfillment. We will do our best to get your products to you just as soon as possible. We offer free shipping via USPS Media Bulk rate that will deliver to most places within 5-7 days. If you need your product shipped to you sooner please call us at the church to arrange for expedited shipping. If you are in the Buffalo, NY area please come by to see us at 598 Buffalo Road, East Aurora, New York 14052-0236, we would be happy to pray with you! 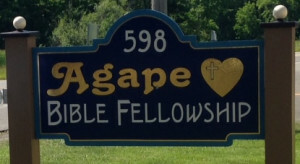 Our services are held on Sunday mornings at 11:00AM, and mid-week Bible study on Thursdays at 7:00PM. All are welcome!